This new television show on E! is crazy. The hosts are funny, and the daters have no boundaries. The show is good. The panelists are good. You will laugh out loud. I saw the first two episodes and they’re worthy of your time. Trust me. E! 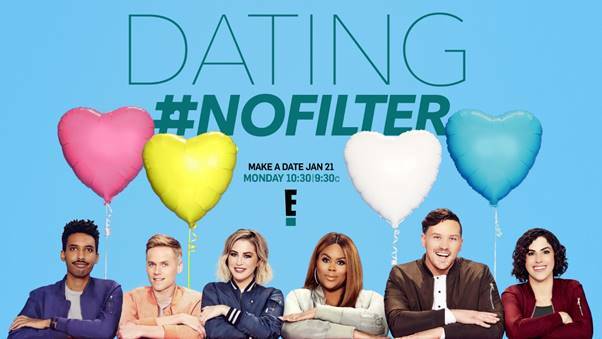 expands its original nightly programming line-up with a 20-episode order of the new unscripted comedy blind dating series, “Dating #NoFilter,” to air Monday through Thursday starting Monday, January 21st at 10:30p ET/PT. From Lime Pictures and All3Media America, “Dating #NoFilter” is a fresh and hilariously honest take on the modern dating scene for the socially savvy, right-swiping generation. In each buzzy half-hour episode, three pairs of outspoken comedians will serve up play-by-play’s as they follow real singles on the most outrageous, intimate, and surprising first dates. Throughout the blind dates, the comedians will offer their candid and unique POVs as they weigh in on every accidental love story pulling at viewers’ heartstrings and the “OMG-no!” cringe-worthy moments, with real, unfiltered and clever commentary. Follow along on social using hashtag #DatingNoFilter and handle @e_entertainment across Twitter, Instagram, Facebook, and YouTube.